These daily devotionals make it possible for the reader to connect with the feasts and seasons of scripture by providing specially selected Bible readings for each day of the Biblical Calendar Year. The Biblical Calendar is lunar and each month begins at the appearance of the new moon. New Year falls at the time God ordained to Moses in Exodus 12, with the month containing Passover, and the beginning of the barley harvest in the Land of Israel. As the reader journeys through the Biblical Year, it will be seen how certain days, feasts, and seasons of scripture reveal profound truths which relate to our own lives and to God's plan of redemption. In Time with God will appeal to all believers who want to connect with the truths revealed in the Bible, against the rich background of the annual cycle of Biblical time. No knowledge of Hebrew is required, so this powerful devotional resource is accessible to all. The author studied Theology at Avery Hill College, London, and taught English to refugees and asylum seekers in the inner city. She studied Hebrew in Jerusalem, and served at Christ Church and the Garden Tomb. Her four years in Jerusalem inspired her study for this book, as she observed the Jewish people keeping the feasts and seasons of the Biblical Calendar. This book can be purchased from the publishers web site at In Time With God Publications. The cost of the book is £9.99 excluding post and packing. 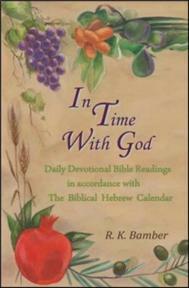 You can also purchase a useful A5 Hebrew-English calendar to accompany the book.